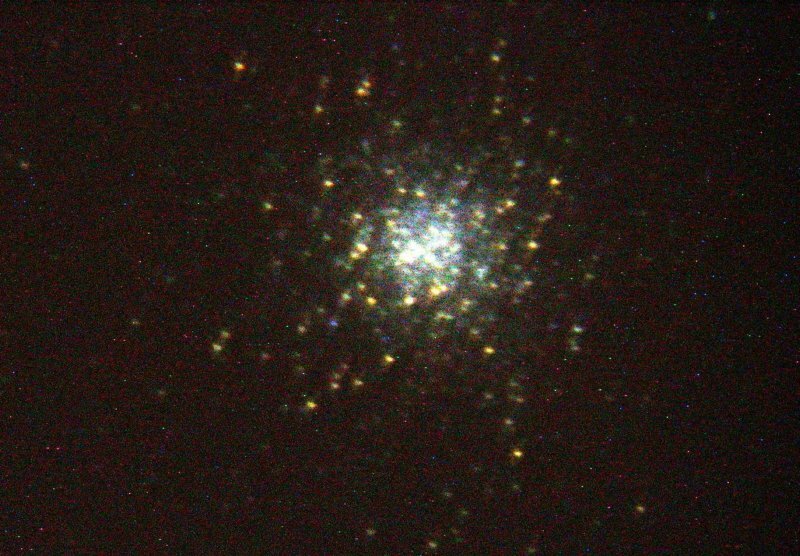 On Saturday of Memorial Day weekend (May 29, 2010) I took this image of M13, the great globular cluster in the constellation Hercules. I used the Meade 2120 (10" SCT) and my Nikon Coolpix 995 camera in afocal projection using a cheap chinese projection eyepiece that screws directly into the filter thread of the Coolpix lens. The image is a composite of 6 TIF images (one darkframe subtracted from all 6 TIF files). ISO 100, 60s exposure time, focal length 10.7mm, F2.9. Since the telescope was on our wooden deck, there was some shaking and some of the 6 images had minor movement artifacs.